When The Killing Season aired on ABC TV this year Prime Minister Tony Abbott lifted his arms to the press gallery and declared "Thank you to the ABC". This was the ABC's 4th landmark TV series on political leadership but will there be another? Will our current and future leaders feel the same obligation of history? Or will future leaders no longer trust their legacy to a media they don’t control? 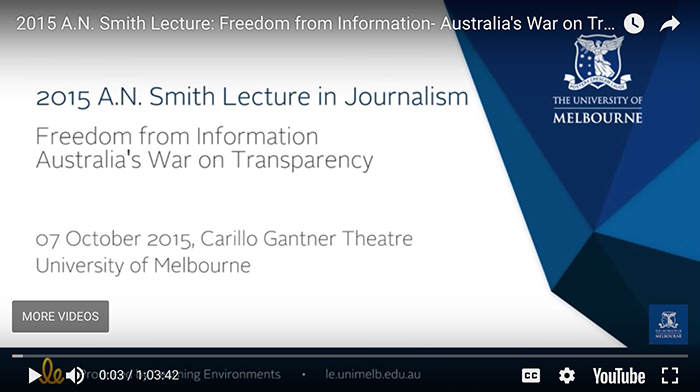 Walkley Award winning journalist Sarah Ferguson, whose documentary series on the Rudd/Gillard years The Killing Season made waves earlier this year, presented the 2015 AN Smith Lecture in Journalism.